US-led NATO forces armed, funded, trained, and even provided air support to Syria for Libyan terrorists emanating out of Libya’s eastern Cyrenaica region – most notably Benghazi which had served as the premier international terrorist recruiting ground in the world, according to the US Army’s Combating Terrorism Center, producing a percentage per capita of militants outstripping even that of Saudi Arabia. Operating under the banner of the “Libyan Islamic Fighting Group” (LIFG), a US State Department, British Home Office, and United Nations-listed international terrorist organization, and officially merged with Al Qaeda in 2007, its commanders including Abdul Hakim Belhaj and Mahdi al-Harati led NATO’s military proxy forces on the ground as US, French, and British planes destroyed the nation from the air. In essence, just as Al Qaeda had served as an “Arab Foreign Legion” for the US in Afghanistan in the 1980’s during its inception, it once again is serving as a foreign legion inside Syria, fighting Washington’s proxy war against the Syrian government. 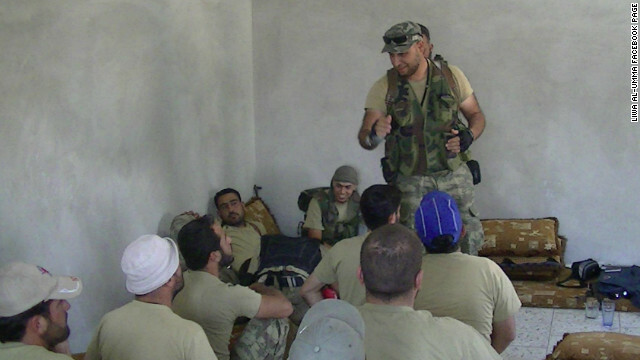 It appears however that unlike in Afghanistan where Al Qaeda fought alongside a sizable indigenous force against foreign Soviet troops, the tactical environment is revered – where Washington’s proxy terrorist forces are foreigners facing a highly motivated, well organized, and better armed indigenous Syrian Army. Coordinated attempts by NATO and its proxy forces to invade and overrun the cities of Damascus and Aleppo in July and early August have failed, with proxy forces being expelled after suffering sizable loses. An attempt to decapitate Syria’s leadership in a bombing in central Damascus also fell flat, with high ranking officials quickly replaced, followed quickly by a cohesive military counter offensive. The bombing was also followed by the mysterious disappearance of Saudi Arabia’s Bandar “Bush” Bin Sultan, who if confirmed assassinated, may indicate that NATO’s plans are suffering at even the highest levels of organization. Compounding the West’s attempts to overthrow the government of Syria, is the increasing support Syria has been receiving due to Iranian efforts to assemble international forums representing half of the world’s population, condemning the support of foreign interference and promoting alternatives to the violent destabilization being carried out by the West. 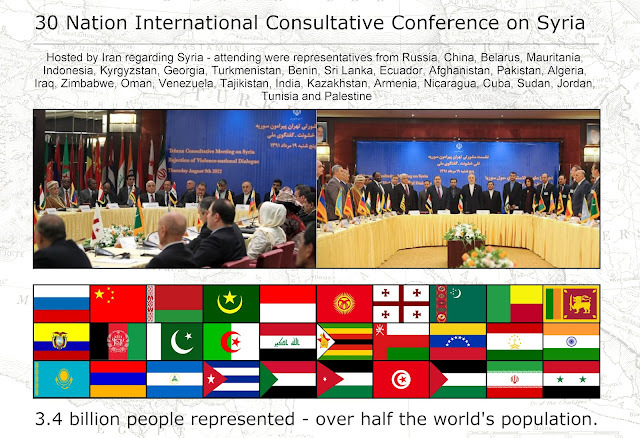 A 30 member conference was held ahead of the annual Non-Aligned Movement (NAM) meeting in Tehran, Iran – and another meeting will be held again on the sidelines of NAM toward the end of August. Image: An impressive counter to the so-called “Friends of Syria” confabs held by Wall Street and London corporate-financier interests in an attempt to sway global opinion toward a repeat of Libya’s destruction at NATO’s hands, the International Consultative Conference hosed by Iran seeks to end the flow of foreign arms into militant hands and resolve political differences through more civilized means. With the tactical situation inside Syria deteriorating for Western proxies and international consensus shifting in unprecedented directions against Washington and London, shareholders in the West’s latest adventure appear to be making tacit moves to divest their support and protect their own interests, lest they be left with the ignominious results of an increasingly compounding failure. Obama claims that the US “fears” Syria’s unconventional weapons “falling into the hands of the wrong people.” If the US is willfully arming, funding, and threatening to back militarily, listed Al Qaeda terrorist organizations, then whose hands is the US referring to? And while the US struggles to foment victory in Syria, it seems to have stretched its support for terrorism all the way to Russia’s Caucasus Mountains, reigniting violence there, linked to Al Qaeda as well. Image: The Washington Consensus’ shrinking legitimacy is proportionally matched to its increasingly untenable perpetuation. Its unjustified, disastrous military adventure in Libya seems to have resulted in a Pyrrhic victory, hobbling the institutions and legitimacy it needed to likewise undermine and overthrow the Syrian government in a timely fashion. Overstretched, it appears the West is even trying to strike at Russia with terrorist proxies that now span from North Africa all the way to the Caucasus Mountains. To say that the US is overstretched is an understatement. It is overstretched politically, economically, and tactically. It risks a historically unprecedented collapse that would destroy all shareholders invested in its increasingly unhinged and transparently illegitimate ambitions. Nations, in particular GCC members, are beginning to realize with acute alarm that their support of Washington’s agenda is now threatening their very self-preservation. A victory even at this point would still likely be Pyrrhic. No matter how well Syria goes for the West from this point on, the mechanisms it has used to get here, including its “Responsibility to Protect” doctrine, the legitimacy of the UN, the West’s so-called commitment to “human rights,” and the narrative of the so-called “War on Terror” have been undermined beyond salvage. One can only imagine the mountains Washington is promising to move in order to keep its allies lined up behind them, particularly the ruling governments of Turkey and the GCC. For an elitist clique that has prided itself in “realist” political discourse, it has become increasingly surrealist. Whether or not Washington’s allies mirror this surrealism all the way to their own demise, remains to be seen.